As the Facilator for three separate one-year long leadership training programs for aspiring community leaders in Central California since 1987, Vicki has guided and coached future leaders in the development of skills and knowledge needed for community leadership. For further information about these programs please visit the following web sites. 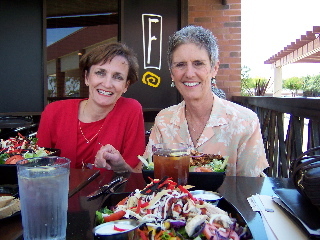 Vicki and Mayor of Clovis, California planning a leadership program over lunch.